Transfer signed "Kennedy" for James Kennedy, Burslem active c. 1790 - 1800. 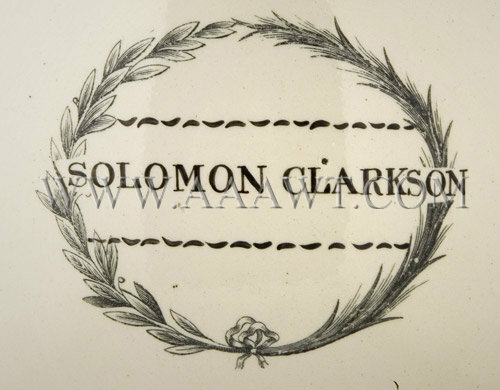 Beneath the spout is a transfer wreath of laurel and palm surround the hand painted name "Solomon Clarkson." Printed on one side within a circular medallion enclosing the inscription "PEACE, PLENTY AND INDEPENDENCE," flanked by 'Peace' and 'Plenty' and surmounted by a cannon, American flag and eagle. 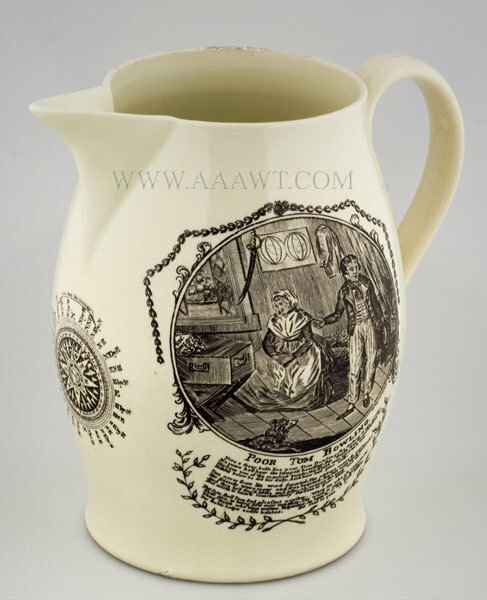 Under the spout is shown the owner’s name, Anstress Sloccum, within oval lozenge; According to family history this was a wedding gift…Anstress married whaling captain Jesse Bidell in 1803; Captain Bidell sailed out of new Bedford and Sag Harbor, NY; they lived on Long Island. The other side depicting an unidentified American ship with polychrome enamel highlighting the American flag off the stern, the American flag pennant, the hull and water. 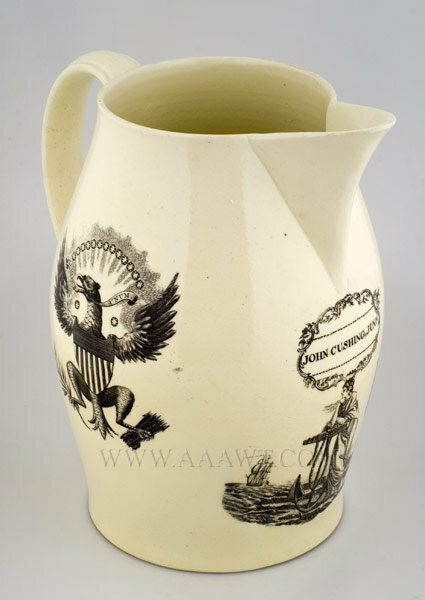 The jug remains in very good original condition; height: 8.75"
One side depicting the thirteen linked states centered with the figures of Peace, Plenty, and Liberty; the other side depicting the thirteen linked states centered with an American eagle and shield. Depicted is a standing soldier and emblems of independence and prosperity framed by "Success to America whose Militia is better than Standing Armies - May its Citizens Emulate Soldiers And its Soldiers Hero's - While Justice is the Throne to which we are bound to bend - Our Countries Rights and Laws we ever will defend". 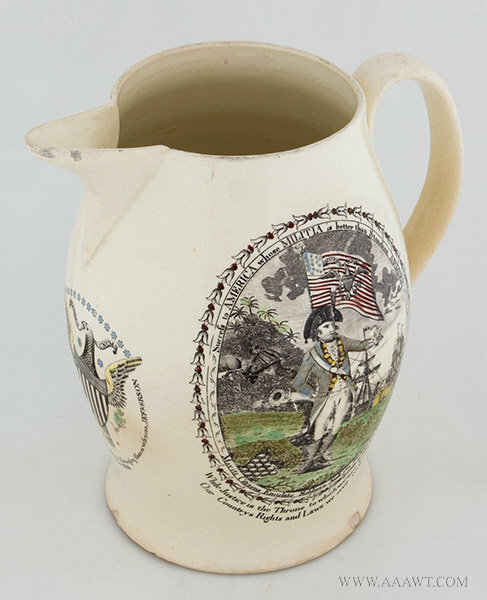 Right side of the pitcher displays an American Merchant Ship flying her American Flag with 15 stars. 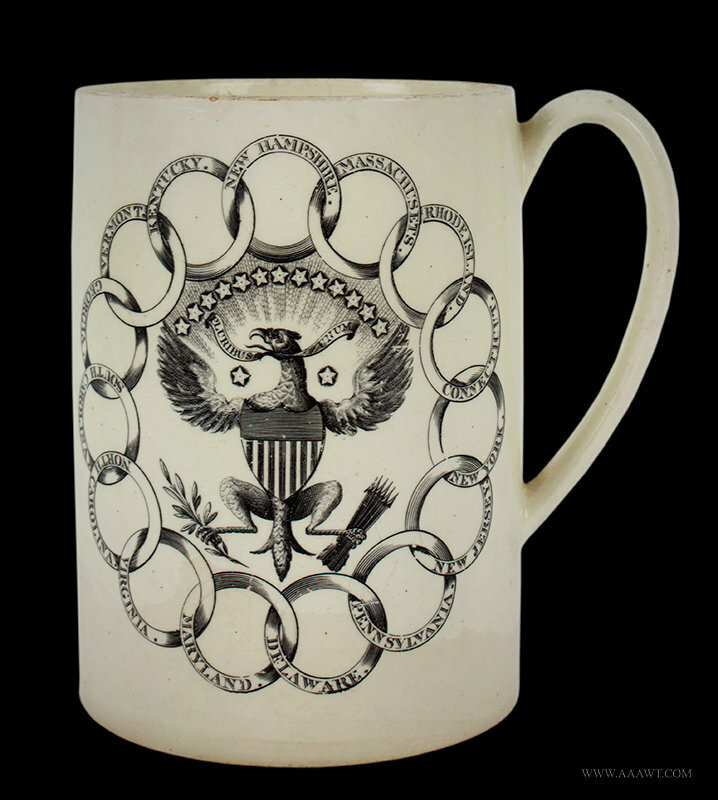 The transfer below the spout is a spread-winged Heraldic Shield American Eagle, with ribbon in beak with "E. PLURIBUS UNUM" and clutching an olive branch and arrows in talons, with surrounding inscription, "Peace, Commerce and Honest Friendship with all Nations. Entangling Alliances with none - Jefferson". Black transfer printed, obverse, "Harvest Home," the reverse, "Sweet Maid an emblem of the Lamb you bear-May your life pay without a guilty tear." 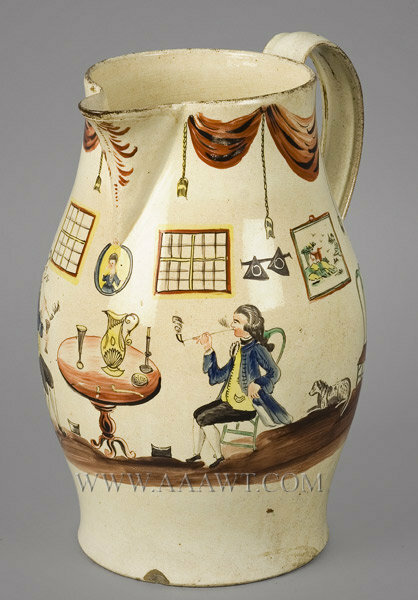 A full interior scene painted over-glaze with enamel colors; two gentleman seated at table smoking pipes and drinking. The outstanding decoration includes a tall-clock, dog on floor, Queen Anne chairs; tricorn hats hung on wall, wall decorations, windows, and more; all surmounted with tasseled swag drapery. 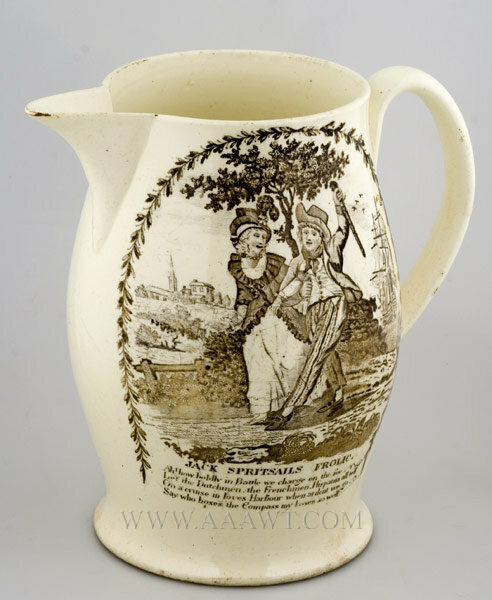 Solon assembled a large collection of locally made pottery, especially salt-glaze ware during his early years in Staffordshire; he featured his collection within his 1883 publication, The Art of the Old English Potter. 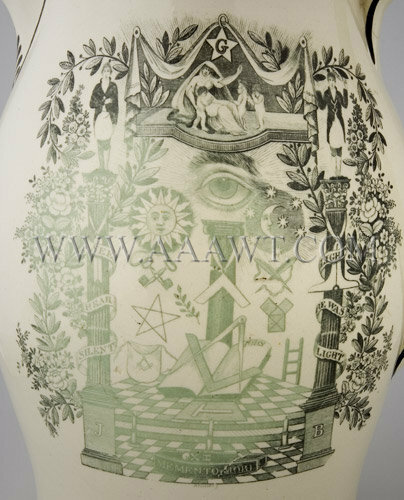 Solon wrote a number of books about pottery including, A History and Description of Italian Majolica (London, 1907), and, Ceramic Literature (London, 1910); he amassed a collection of more than 3,500 works related to the history of ceramics. 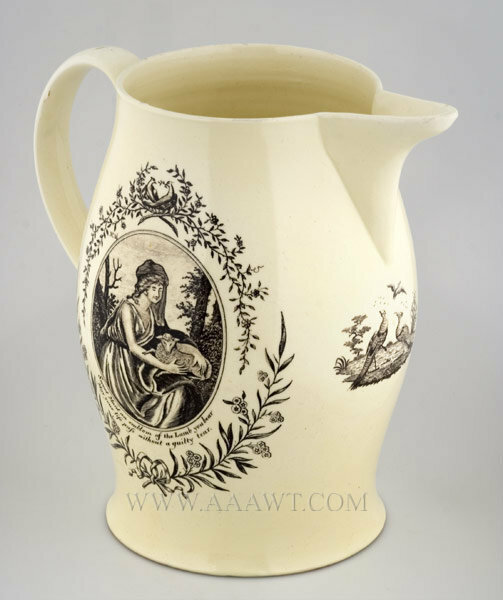 Solon's collection, including this jug, was sold by Charles Butters from 26th to 28th November 1912; after his death his library was sold to the Central School of Science and Technology, later the North Staffordshire Technical College and North Staffordshire Polytechnic. (The collection is in the archive library, Hanley). Both sides decorated with polychrome transfer prints; the 1782 portrait of Carleton, the most hated British Commander of the Revolution, is after the portrait by Joshua Reynolds now in the National Portrait gallery. (See Alan Smith's, Liverpool Herculaneum Pottery, pp. 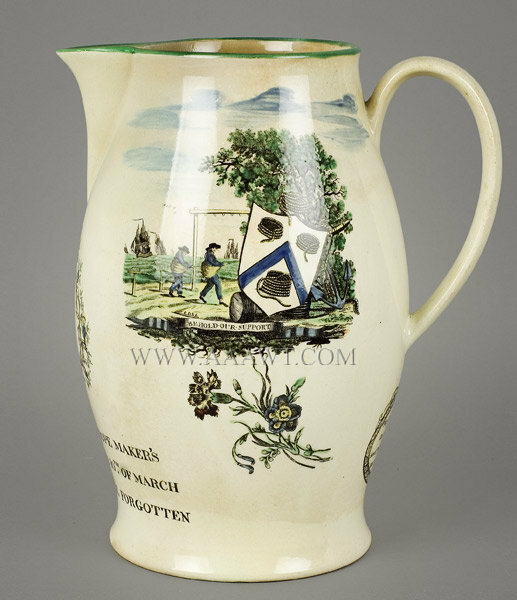 33-35; also plate 17 for another jug with the hand-colored Colonel Tarleton print.) The other side depicts rope makers at work, ships at sea, landscape, and legend, "BE HOLD OUR SUPPORT" above a floral spray. Under spout is found script initials GLG above 1793 within floral wreath; beneath is the legend, SUCCESS TO THE ROPE MAKER'S AND THE GLOURIOUS'S 10TH OF MARCH MAY IT NEVER BE FORGOTTEN. 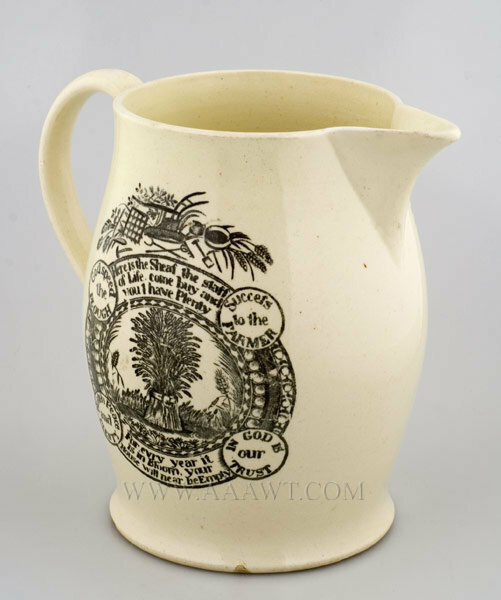 The rim is trimmed in green enamel; beneath the spout within lozenge is printed, "MAY TRADE AND COMMERACE - ON OUR NATION SMILE - AND PEACE AND PLEANTY - BLEFS [BLESS] THE BRITISH ISLE". Original condition! 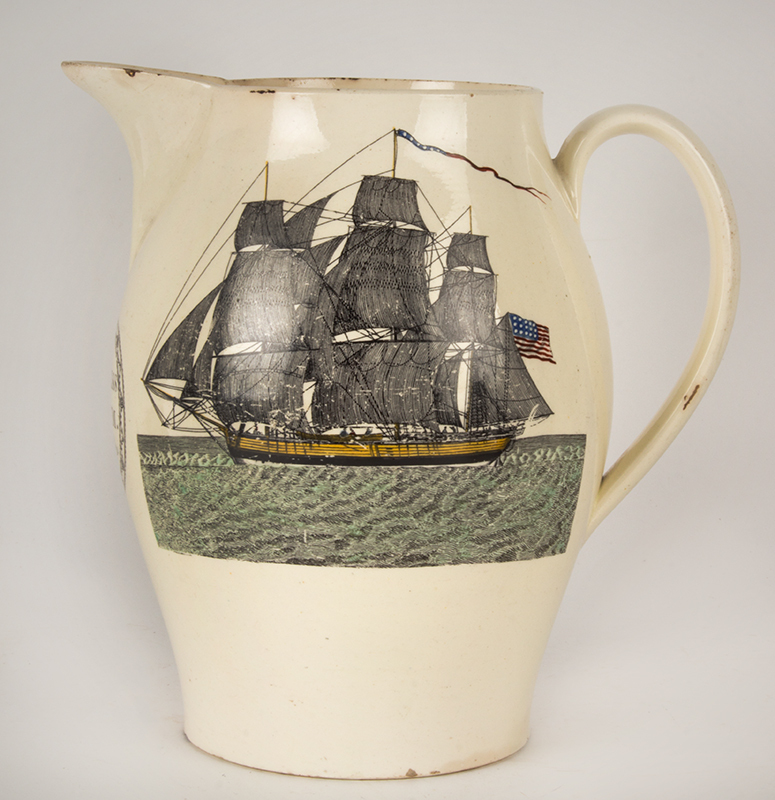 Black transfer printed, obverse with ship "Joseph" colored in enamels; under the spout is printed "Joseph Cushing Junr." 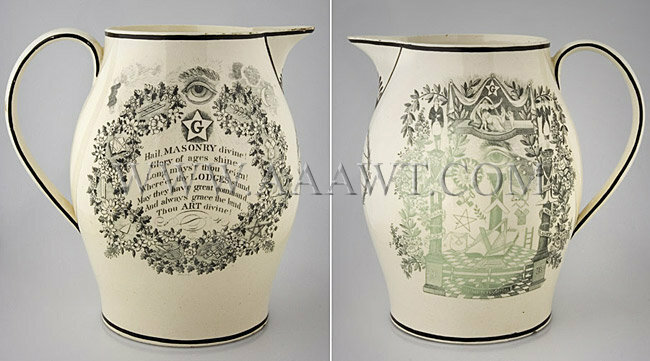 within cartouche above black transfer depicting a woman leaning on anchor looking out to sea, the figure of "Hope". The reverse with black transfer printed United States great seal. 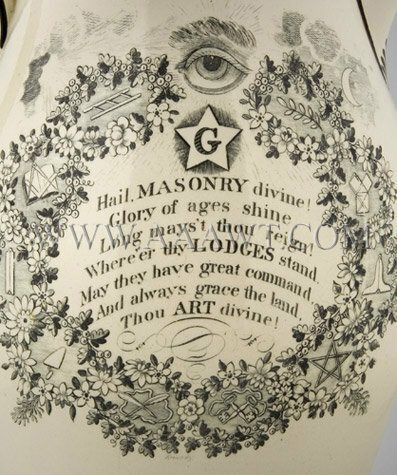 Black transfer printed, obverse, ship flying American flag, compass under spout; the reverse with transfer printed tribute to idealized sailor now deceased, depicted are mourners within interior scene with coffin within oval festooned by leafy garland; verse below. Black transfer printed, obverse featuring transfer of three-masted English ship above panoply of flags and cannon with motto in banner "Success To Trade" also, a comical vignette depicting a sailor and his girl above a poem entitled "Jack Spritsails Frolic".